Ohhhhh, look! A Finished Object! 1. This was originally a pattern from an afghan book. After several inches of slipping a stitch for five rows (with bulky yarn!) and dealing with wicked pucker and amazingly off row gauge, I chucked the pattern and decided on plain old stockinette stitch. 2. The “pattern” (used loosely) was about 82 st cast on, and six rows with each color. 5. If you get a chance (if you haven’t already) listen to the Cast On podcast (#2). In the Knitter’s Manifesto, she talks about how our choice of yarns and patterns reflects our personality and our state of mind. 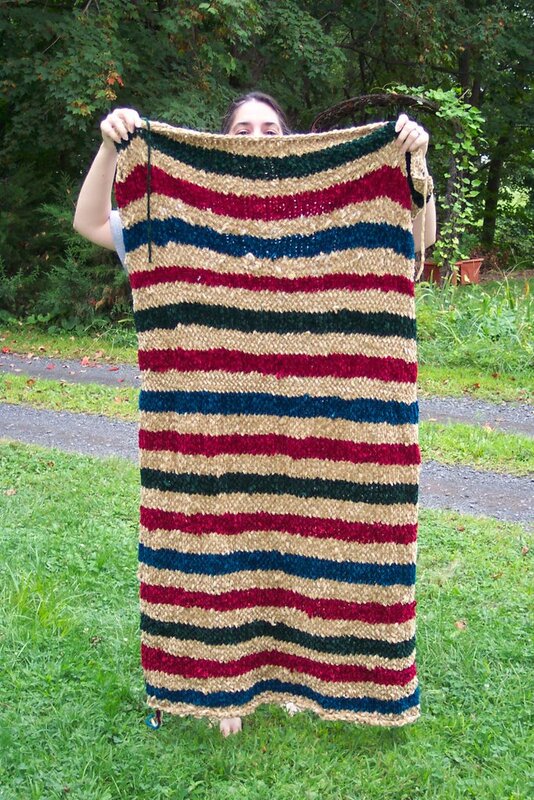 I shudder to think of what a probing mind might think of me in regards to this afghan. 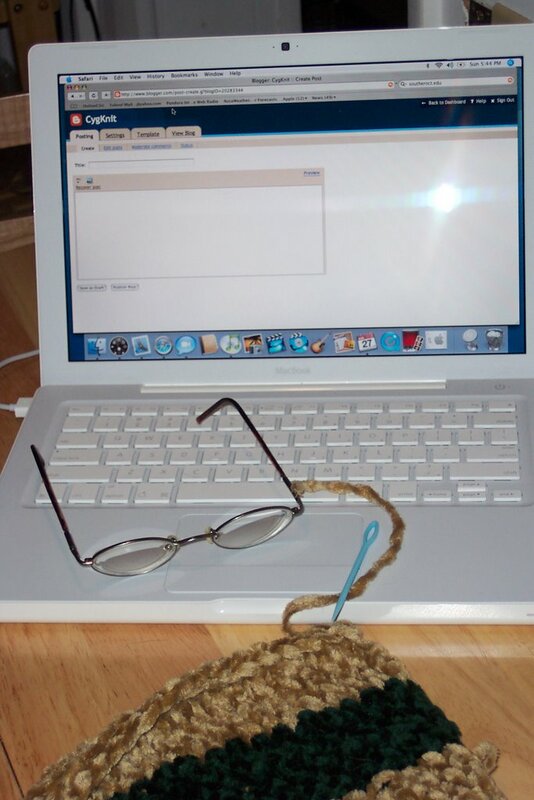 (Cheap, white trash knitter?) But don’t think that’s not affecting my choice of future projects. Now do I get to cast on something fun? …there may just be an FO in the future. Sunday morning, 9 AM: With one cup of coffee in me and another cooling in the mug, I continue Saturday evening’s joyous casting off of the damn afghan. Sunday, 9:45AM: After forty-five excrutiating minutes (mostly involving preventing the Olive from hopping into my lap) I cast off the last stitch. Much rejoicing ensues, immediately followed by a trip to the bathroom (having refused until I cast off the last stitch). Sunday, 5:40 PM: Having successfully ignored the afghan all day in favor of a visit to an open-air market at a local Mansion, (I bought wool! And organic taters! In the rain!) I sat down to weave in a few ends. Sunday, 6:20 PM: Successfully posted pictures of my new baby. Wove in an end or two. 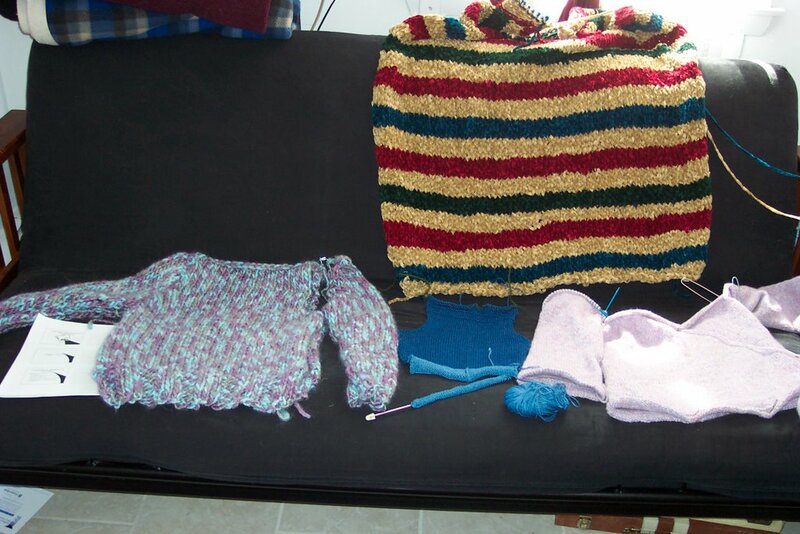 Sunday, 8:40 PM: After diving through a small trash can’s worth of now-used tissues in an attempt to retrieve all the ends I’ve woven in (for a clever picture), I return the afghan to see how many more of the flippin’ things I have left (I washed my hands. Ewww.) Found 1 (one) end left to sew in. Sunday, 8:45 PM: Still staring at the afghan in shock. Sunday, 8:47 PM: Resigned myself that Dragon is right, it will look better with a crocheted edging. Weaving in ends! How fun! I think she’ll be a good fit. Don’t you? What I would really like to be doing right now is showing you some progress on the UFOs. I failed to realize this week was that Mr. Cygknit’s return to school meant one thing–the laptop went back to school, too. *Sigh* Now, this laptop is the only computer (of 3 in the house, not counting those inhabiting the attic) that’s connected to the Internet. Don’t ask me why. As well, it is the only computer that can handle the digital camera. So, tomorrow, pictures. My mother is going to Italy next May, and wants me to knit a shawl for her. Ok, that’s a short story. Want the long version? My mother does not like to fly. When my mother flies, she has a tendency to use the airsick bag. And those of the her immediate seatmates. And those of the inhabitants of all the rows in the vicinity (Ask me how I know). So, it is only logical that she fly to Europe. I say that with some sarcasm, but the truth is that I’m proud of her. While we don’t have the best relationship (or even always a good one) she’s not been free to do whatever she wants for a good many years (and that’s a different story). The only time she’s been out of the country in my lifetime was the time when we went to Toronto–for just as long as it took to see the CN Tower, then back across to NY. So, Italy is a big thing, and me being asked to make something for the trip is an even bigger thing. 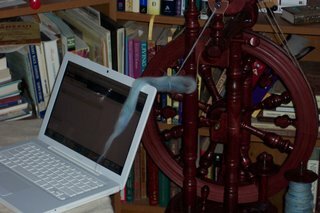 So, of course, I want to make the Perfect Shawl. Not only should it be technically perfect, it needs to visually embody the idea of a shawl. It needs to be exactly what my mother wants, even though she has no idea what it is that she wants. No problems there, right? It needs to as fuss-free as possible. She’s not a fusser, and will ball it up into the corner of the suitcase if she has to futz with it sliding off her shoulders all the time. I refuse to sweat over something that will annoy her. It needs to be lightweight enough for late Spring mornings and evenings. 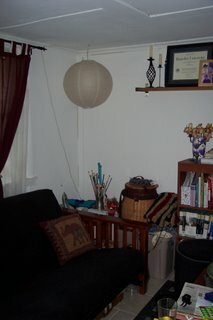 Although I was thinking a neutral color, she would like something bolder. Maybe a turquoise? 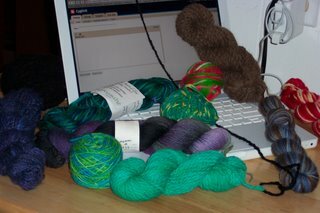 My requirements: It needs to look like a shawl–no weird (for her) motifs like frolicking sheep. We’ll save that for me. It needs to be easy enough that I don’t spend months sobbing over my inadequacies. 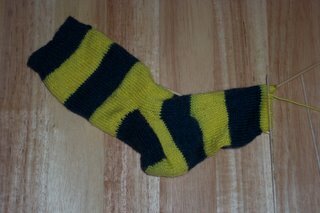 Sock 2. The yellow zone was my wait at the Dr.’s office yesterday, the black section above it was done at a Terry knitting lesson/wine tasting. 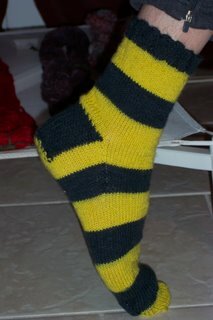 Now, I just have more yellow, more black, and some more soul-crushing yellow before I can declare an FO. The Hourglass sweater from Last Minute Knitted Gifts. 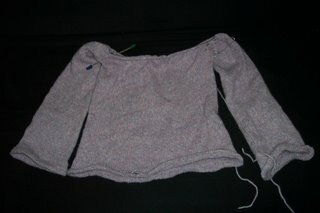 Sadly, it only needs a few rows of last raglan shaping and some hemming. You’ll notice that the left sleeve has already been hemmed? I didn’t realize that I could do it as I go until I was on the last one. *sigh* On the positive side, Sensations Dolcetto has been one of the best yarns I’ve worked with–regardless of the fact that it is a Jo-Anne Fabric brand and yarn snobs everywhere would snub me. Next time you slink in there, (checking both ways to make sure no one is looking) pet some of this stuff. Seriously good. …which is much like poking your eyeballs with tiny dpns, over and over. Summer is very nearly over in New England. I will want sweaters soon, despite today’s nasty humidity. Do I really want to cart around any more unfinished object guilt?? It is a little unreasonable to have my Olympic Sweater still undone. Did I mention that I want to cast on lots of new stuff?? Ok, so last September I went to Florida for 5 days . I knew I’d have to do a LOT of knitting to say sane–the least stressful aspect of that trip was that my dad watches FOX News 24/7. I needed to knit. So, in an effort to improve my skills I decided to make 7 X 9 squares for Warm Up America. 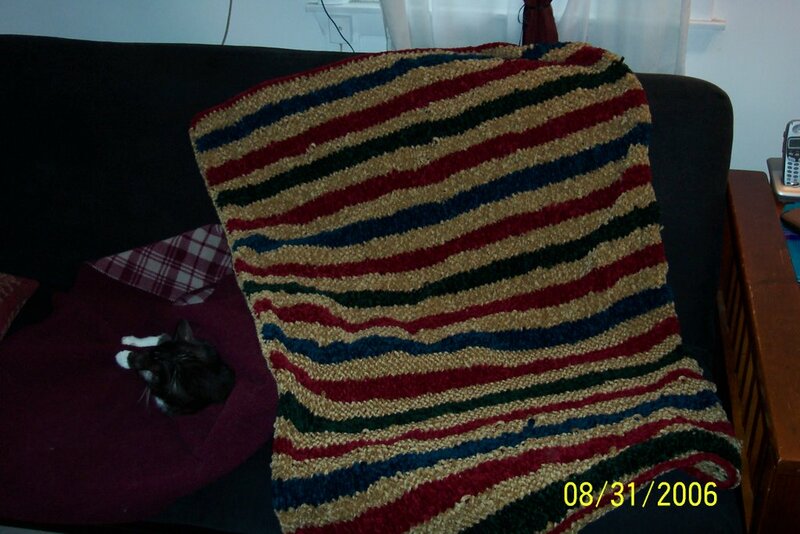 Pop (as my dad likes to be called) kept asking if I was making an afghan for him. Picking up on that gentle clue, I picked up 10 skeins of Lion Brand Chenille Thick and Quick. Yes, I am embarrassed, but it really seemed like a good idea at the time. I ended up hating the pattern I picked for it, and ripping it all back. Just so you know, it says right on the label not to rip it out. 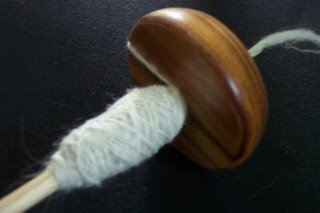 Or the yarn will fall apart. I kid you not. 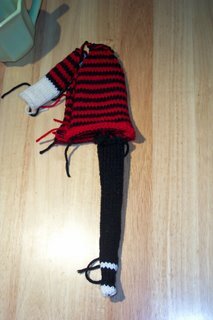 I cast on the above plain stockinette monstrosity, instead, and have been forced by various friends and family to continue working on it. Even Olive the Cat hates it, and has shown her rampant dislike by dumping beer on it. 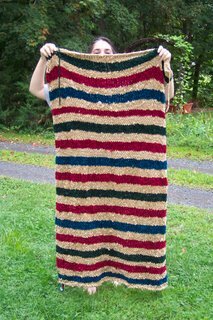 I have one color strip (6 rows) left. Amen.